WOW! What an exciting year for ASHA attendees! Lingraphica had fabulous booth attendance and five poster sessions and presentations. Our team shared the latest research in aphasia, speech-generating devices, tele-therapy, and social media. In addition to our presentations, we met numerous speech-language pathologists and clinicians who are deeply committed to advancing the field. This is always so inspiring to our team. Here are our quick takeaways. We selected “Be Unlimited” as a theme for our ASHA booth this year. We believe the possibilities for a speech therapy practice and the clients who visit it are unlimited, especially with all of the offerings Lingraphica shares. We demonstrated this theme with selfies at the aphasia tree of knowledge, balloons, fun pins, social media giveaways, and in-booth demonstrations of our two new products: TalkPath Therapy and AllTalk with EyeGaze technology. We were excited to introduce more than 6,000 new cognitive exercises to our TalkPath Therapy platform. Now, the Online-and-App-Based platform has more than 10,600 exercise for clinicians and individuals to use for free. We also debuted our AllTalk with EyeGaze technology. Now, our most versatile speech-generating device comes with EyeGaze technology to help individuals with physical needs communicate. In years past, there were a handful of presentations on teletherapy. This year, there were more than 30 presentations on the topic. Clinicians in private practice, hospitals, and aphasia centers shared how the combination of advanced technology and evidence-based practice has allowed them to incorporate tele-therapy into their practices. Lingraphica was pleased to take part in many of these discussions, especially as we share the latest news from our study at the Synder Center for Aphasia Life Enhancement (SCALE) in Baltimore, Maryland. Dr. Richard Steele led this presentation along with several clinicians from Baltimore, Canada, and New Jersey. We look forward to sharing more about this platform and study in the spring. One particular detail that surprised and pleased our team was the prevalence of aphasia-centered presentations. Our friends at Aphasia Recovery Connection as well as numerous aphasia centers and the Voice of Hope organization lead the charge for aphasia with presentations, breakfasts, and showroom floor meetings. Our team was pleased to participate in many of these gatherings. We’re happy to report that the commitment to adults with aphasia is strong. In the past month, Lingraphica has been involved in an advocacy campaign called #saveSGDtech. This advocacy campaign was associated with the potential changes to speech-generating devices and Medicare’s coverage of this technology. During ASHA, we participated in a discussion with other distributors and partners in our field. These discussions were fruitful and positive, and have prompted Medicare to open a new National Coverage Determination (NCD). Thank you for your support for aphasia, speech therapy, and speech-generating devices. 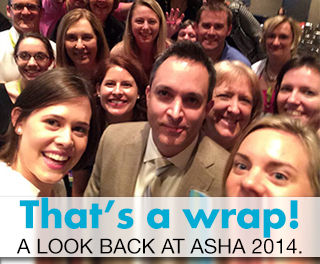 In the coming days, we will share more about the research we shared during ASHA.